It’s the time of the year when home gardens have tomato plants laden with fruit, mostly green or about to ripen. The few plants that I have are doing well and yesterday I picked just ten green tomatoes. 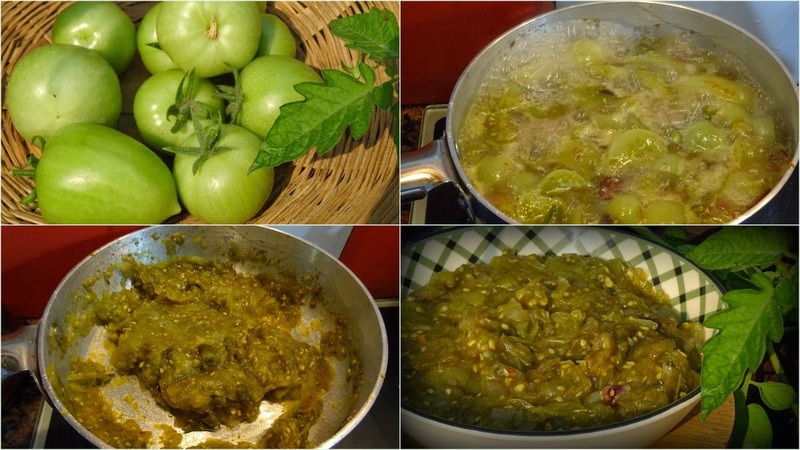 I usually don’t like to pick them when they are at this stage but green tomato chutney from the plants I grow will be a yearly feature on my blog. I checked my post from last year and noticed that I had posted that on 7 March. But this is a little different from my previous post. The easiest chutney to make, I think. Hull the tomatoes, wash and chop them up. Put them in a pan and add water. It should just about be the same level as the tomatoes. Bring it to a boil and add the onions. Add the cinnamon sticks as well. The chopped chillies can go in now. Let it bubble and froth away and then add the seasoning. Stir in between. It will start to thicken. Add the vinegar and cook till the moisture dries up. Take a bit out in a spoon and check. Make any adjustments with the sugar and the salt at this stage. Remove from the flame. Discard the cinnamon sticks. Cool and transfer to a bottle. Keep in the fridge. I kept mine in a bowl and it looks like it will be over by tomorrow. We had two friends over for dinner yesterday and I wanted to add something from home-grown produce and this chutney turned out to be just right. They loved it! The menu had freshly-baked bread, pork roast, baked eggplant with cheese, a salad and mini chocolate tarts for dessert.